This beer pours a very dark brown, almost stout dark, there is just a little bit of rich amber reddish hues peeping though the edges and bottom of the glass. This beer also produced a very rich and creamy tan head. The nose is just packed with wonderful Christmas aroma of spices and sweet toasted malts. 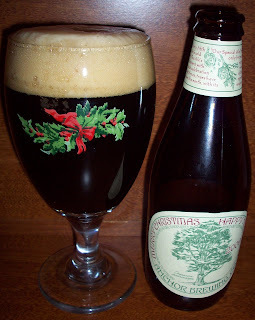 Wow, Another Christmas in a Glass beer. Everything that is on the nose of this beer is in the taste and then some. The taste starts out with sweet dark malts, then a nice carbonation over the tongue. Just before the swallow you start to pick up all of those Christmas spices then there is somewhat of a drying effect and the finish is of spice and a slight bitterness all with a creamy malty mouthfeel. This is just a wonderfully crafted beer. The thick rich head has diminished to a nice creamy protective layer over the top of the beer with a thicker ring around the glass. The lacing is extremely impressive, coating the glass as you drink this wonderful brew down. There is bitterness on the back end and finish of this beer. It seems more like a roasted malt bitterness rather than a hop bitterness. You can taste and smell some light hops but the bitterness still seems more from the roasted malts. I do not remember last year’s brew having this bitterness. I guess that’s why each year is a slightly different recipe. As this beer warms and opens up a little it just gets better. Now at it’s at 60 degrees and still fantastic. The last little but left is now at 63 degrees. The malty bitterness is a little more pronounced at this temperature but all and all it’s still a very smooth and delicious beer. Well all good things must come to and end and so must this beer. 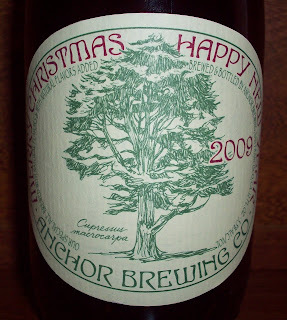 This is an excellent Christmas beer from Anchor. I think I liked yeast years version a little better than this years but nonetheless this is a very impressive Christmas ale, a solid A+ for me.